They’ve battled on alternate worlds, explored their earliest days as Teens with Attitude, and even fought the Justice League, but the Mighty Morphin’ Power Rangers’ next major comic adventure is an anniversary spectacular: one where 25 years of rangers unite to face a threat against them all. Kicking off in Power Rangers #25, “Shattered Grid”—by Kyle Higgins and Daniele Di Nicuolo—will see the return of previous comic villain Lord Drakkon, an evil alternate-dimension version of Green Ranger Tommy Oliver. But instead of fighting on his own despotic earth, Drakkon will bring an army of cross-dimensional goons to the Rangers’ universe, threatening not just the “present” of the Mighty Morphin’ team, but the future of Ranger teams across the last 25 years of the franchise. Eagle-eyed Tokusatsu fans can see there might be hints to go even beyond that 25 year history, with a sly reference to this year’s Super Sentai show Uchu Sentai Kyuranger hidden among the cavalcade of spandex superheroes in the variant cover art above. Main Cover art by Goñi Montes. Call me sentimental, but I love anniversaries. 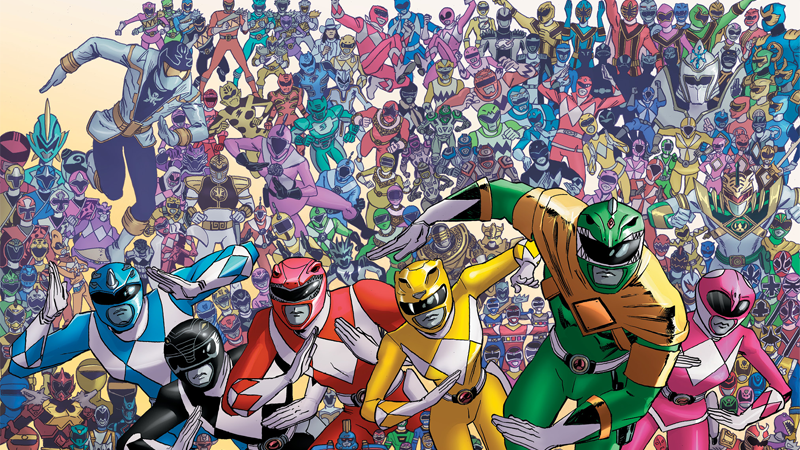 Over the last two years, I’ve been weaving threads in the pages of Mighty Morphin Power Rangers, all leading to the 25th anniversary of the franchise. “Shattered Grid” is a massive Power Rangers event that’s both a celebration of the property and also the largest comics story I’ve ever tackled. Lord Drakkon’s plan is so much bigger than our Rangers, our world, and even our universe. The Grid is shattering, every Power Ranger in all of existence is at risk, and it’s going to take more than just the Mighty Morphin team to stand against Drakkon’s armies. Power Rangers: Shattered Grid begins in Power Rangers #25 on March 21, 2018.